On the 30th September 2013, the Welsh Government amended the permitted development rights for householders, through the introduction of the Town and Country Planning (General Permitted Development) (Amendment) (Wales) Order 2013. Permitted development is development that can be added to a property without first requiring planning permission. The permitted development rights are restricted by a number of controls and conditions that development must meet to benefit from the deemed consent. In the past these controls and conditions have been focused upon a volume restriction approach. However, it was considered that a more appropriate method of control would be an impact led approach. The Welsh Government has provided a Householder Guide to Planning as well as Technical Guidance Note on the specific householder permitted development rights. However, it is important to note that your permitted development rights may have been restricted or removed at the time that your dwelling was originally granted planning permission. Should you require the application reference numbers for your property; these can be provided for a fee of £35. The new regulations are more detailed and therefore require a more complex assessment as to whether a proposed development would benefit from permitted development rights or whether planning permission is needed. As such, the Authority will now require a Certificate of Lawful Development (Proposed) or (Existing) application, prior to being able to confirm whether planning permission is required. If planning permission would be required, free pre-application advice is currently given to the applicant as to whether the development would be likely to receive a favourable officer recommendation at the planning stage (although please note that a charge of £25.00 is to be introduced by Welsh Government from 16th March 2016 for 'householder' pre-application advice). The current fee for a Certificate of Lawful Development (Proposed) is £95, while an application for a Certificate of Lawful Development (Existing) is £190. Fees can be paid electronically if the application is submitted via the Planning Portal or can be paid by cheque in other cases. Cheques should be made payable to NPTCBC. Applications should be accompanied by a site location plan (Ordnance Survey Plan) with the application site outlined in red, at a scale of 1:1250 and with a north point shown, together with a block plan, proposed elevations and proposed floor plans which at this stage can be annotated with dimensions rather than produced to a stated scale. Whilst the plans do not have to be professionally drawn, they still need to be of a suitable standard to enable the Planning Authority to confirm if planning permission is required. Furthermore, it is essential that these plans and elevations are an accurate statement of the development proposed. Any variation from these details could mean that planning permission is required. The drawings must also accurately show any change in ground levels around the area where the proposed extension is going to be built. A planning Officer will be able to give you further advice on this, at the time of your application. 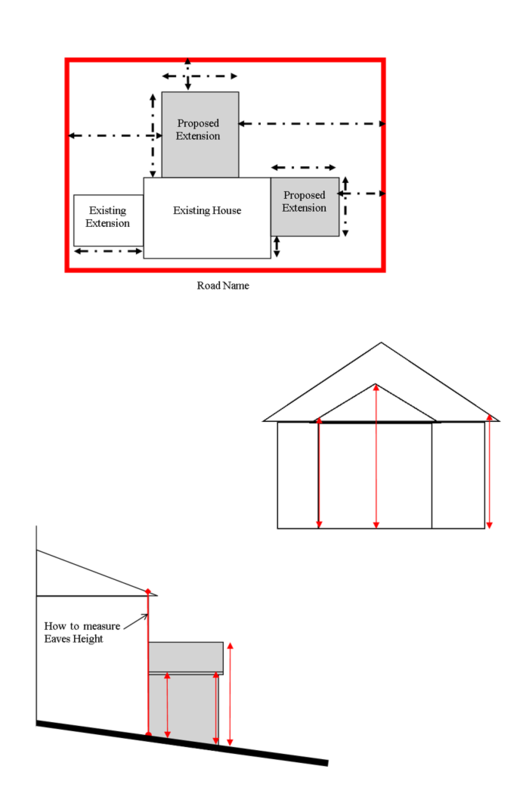 If a planning application is submitted for a proposal and it is identified as being permitted development, the applicant will be asked to complete a Certificate of Lawful Development application form, submit the reduced alternative fee (the original fee will be returned to them) and the application will be determined as a Certificate of Lawful Development. The developer will then have the benefit of a legal determination as to the planning status of the development. This will provide them with legal security in the future, such as when they come to sell the property.